Donna gave me an appointment calendar featuring artwork by Andreas Cellarius. 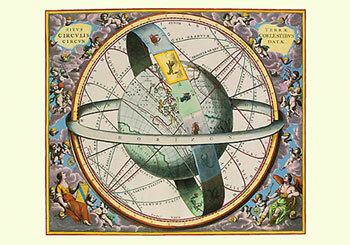 The British Library has reproduced some of his illustrations from his Celestial Atlas of Harmony. Cellarius has visualised the Ptolemaic, Copernican, and Brahe models of the cosmos. I bought a Telrad from Kendrick for Mom for Xmas. I'm looking forward to using this "zero-power" finder. This is because her 'scope is without a finder. And it seems that finder scopes can be fairly expensive. I was surprised how inexpensive the Telrad is. And it's real easy to use. Which will be an important feature for Mom. I confess, it's really a gift to her and me! If I buy an additional mount (only), then I can use it on my 'scope too!